Coalition talks failing in Germany has been the most influential event for EURUSD. The support rests at 1.17230 with resistance at 1.18170 which the weekly pivot point at 1.17610 is located in between the lines. The EMA of 10 is moving horizontally in the ascendant channel and it is above the EMA of 200 and the EMA of 100. The RSI is rising towards the 50 level, the Stochastic is showing upward momentum and the MACD line is below the signal line in the negative territory. The ADX is not showing any clear signals. 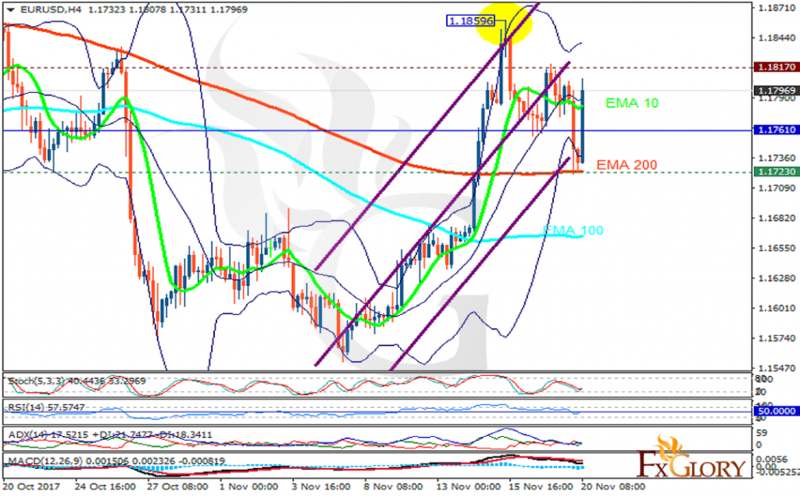 EURUSD may grow towards the upper Bollinger band at 1.184 and then fall towards 1.17.